Huge expectations greet Kieran Hurley's first new piece since his all-conquering Beats. 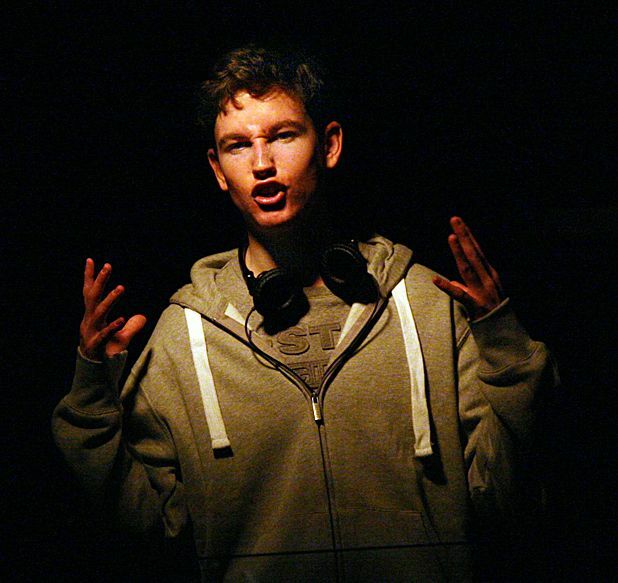 Named best new play at the Critics Awards for Theatre in Scotland and delighting the Traverse audience at the Fringe, his rave generation monologue marked him out as a talent to watch. Chalk Farm, co-written with AJ Taudevin (who co-directed Beats), follows a single mother and her teenage son through the incendiary events of last August. She watches it from their high-rise window while he is down on the streets with his friend Junior. It’s all kicking off to Dido's ‘My Life’ (which is only on his iPod because his mother likes it, he makes this very clear) via his headphones. In just 45 minutes, Chalk Farm creates two convincing characters: Maggie the loving parent, desperate to pack fibre and vitamins into her hoodie-wearing son's Batman lunchbox, struggling to do the right thing on a call centre wage. Jamie, pitch-perfect in his jogging bottoms, is torn between following his mother's moral compass, caving in to peer pressure to join in with what Junior assures him will be ‘history’ and a natural teenage desire to share the adrenaline he can smell coming from the looted bike shop. Taudevin (who is Julia when she acts, AJ when she writes) makes a moving mother, resentful of the ‘blame the parents’ culture, defensive of the son she still thinks of as ‘Pickle’, alienated by the community of which she wants to be part. Royal Conservatoire student Sean Brown is wholly believable as the conflicted teenager who is still, in many ways, a kid. The only wrong note is sounded by the ending (which it would be mean to reveal here). The production is also crying out for some of the audio-visual magic that made Beats so memorable. A greater sense of the high-rise flat plus some sights and sounds of those burning August nights would have given this more weight. As Jamie, Brown makes the most of Oran Mor, buzzing around the space like a furious wasp. Given Hurley’s reputation, and the quality of this raw material, it can’t be long before we see him on a bigger stage. Oran Mor, Glasgow, until Sat 22 Sep.
New play by AJ Taudevin and Kieran Hurley (writer of the acclaimed Beats) written in response to the English riots of 2011. Ticket price includes a pie and a drink. You only get half an hour's technical rehearsal at Oran Mor, and a tiny budget - so it had to be kept technically simple. Loved the ending don't know how better it could be - critics need to offer alternative ending not just criticise for the sake of it!